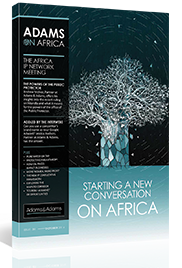 Adams on Africa is a new quarterly digital publication by Africa’s largest IP firm and one of the continent’s most prestigious commercial, corporate and property law practices. The publication aims to provide you with the necessary information and updates on developments in business and the law in Africa. We welcome your feedback. This entry was posted in Intellectual Property, Legal News, News & Insights by Content Desk. Bookmark the permalink.